Sparkling wine is a wine with significant levels of carbon dioxide in it making it fizzy. The carbon dioxide may result from natural fermentation, either in a bottle, ... Sparkling wines are categorized as Extra Brut, Brut (pronounced "broot"), Extra dry, Sec and Demi-sec depending on their sugar levels. Traditional Method, Methode Classique, Methode Champagnoise all mean the same, They refer to sparkling wines produced by a natural fermentation in the bottle. These wines have fine persistent bubbles. Aging on the yeast lees in the bottle produces complexity and creaminess and the celebrated yeast flavours. Each bottle is then hand riddled and hand disgorged to remove sediment - the same as is done in Champagne France. What is the difference between Traditional Method Sparkling wines and Artificially Carbonated wines? Pop, commercial beers, and most mass-produced bulk effervescent wines are artificially carbonated. Manufacturers chill their products and inject carbon-dioxide into them prior to bottling. Wines made this way have large coarse bubbles that dissipate quickly in the glass and do not have any yeast aromas. IF IT DOES NOT SAY TRADITIONAL METHOD OR THE OTHER TERMS REFERRING TO NATURAL FERMENTATION ON THE LABEL - IT IS ARTIFICALLY CARBONATED. L'Acadie Vineyards has worked hard to change Nova Scotia Wine Standards so that these wines must have “Artificially Carbonated” declared on the front label so that consumers can choose wisely. This is what is required in other wine making regions of the world where the term “Sparkling” is protected for wine with bubbles produced from natural fermentation. What is Charmat and Transfer Method? Charmat Method refers to sparkling wines, such as Italian Prosecco, that are naturally fermented in a closed tank and then bottled when chilled to retain bubbles. Transfer method refers to wines that are naturally fermented in the bottle, then emptied, the yeast separated by filtration, and rebottled. Both these methods have a lower production cost, less complexity and coarser bubbles than the Traditional Method. As of yet, no one is using these methods in Nova Scotia. Why is Traditional Method Sparkling an exciting new wine style for Nova Scotia? Whenever you have climates that ripen grapes at moderate sugar levels, you have ideal conditions for Traditional Method Sparking Wines. Nova Scotia has a cool climate that ripens grapes at ideal sugar and acid balances, especially L'Acadie, that rival the best established cool climate winemaking areas in the world. 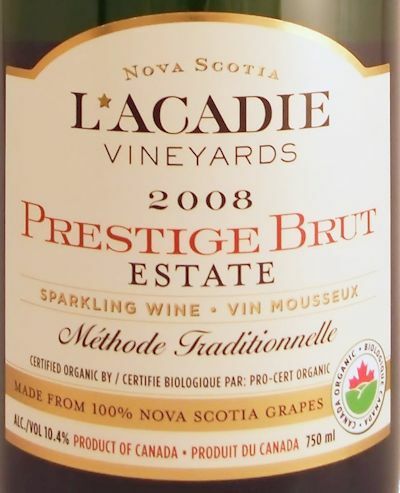 L'Acadie Vineyards has released the first traditional method sparkling wines for Nova Scotia - Traditional Method Brut and Traditional Method Rose, as well as a Traditional Method Certified Organic Cider and others currently being aged in bottle (en tirage), including a Certified Organic Brut. It is possible that Nova Scotia could become known in the world of wine for its Traditional Method Sparkling Wines. Why are prices of French Traditional Method Sparkling Wines (Champagne) more expensive than Nova Scotia Traditional Method Sparkling wines? Champagne has built a reputation of quality for its sparkling wines and people are willing to pay more for that reputation. Traditional Method Sparkling wines made in Nova Scotia are made the same way as ones from Champagne. We are building our reputation and our wines are winning awards and are comparable to many sparkling wines from around the world. The prices of sparkling wines from L'Acadie Vineyards reflect the extra costs of hand picking and gentle whole cluster pressing to low yields, a special strong bottle sourced from France, aging for 12 months - three years plus in our geothermal temperature controlled cellar and the hand riddling and disgorging process of removing the sediment from the bottle. 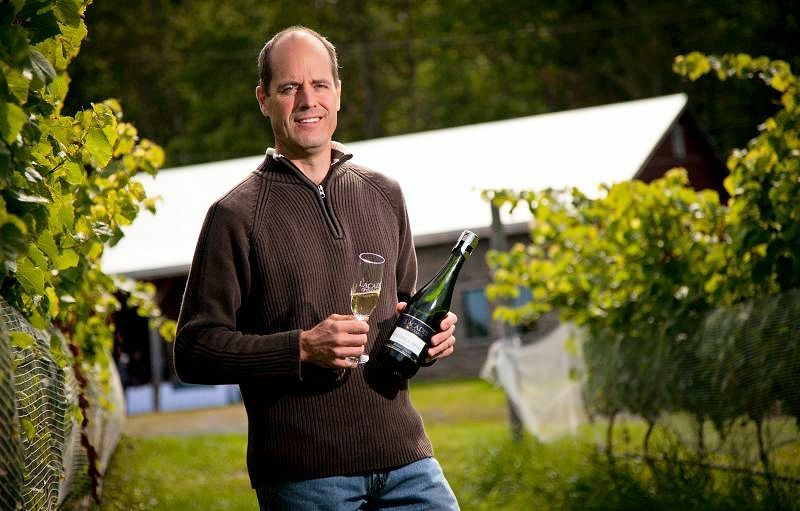 Winemaker Owner Bruce Ewert L'Acadie Vineyards Wolfville Nova Scotia is one of Canadian best sparkling winemakers. All of L'Acadie Vineyards sparkling wines have always been produced by the Traditional Method . “They are, without question, the best sparkling wines I have tasted in Canada,” says Tony Aspler, Canada’s most renowned wine authority. In British Columbia Summerhill Pyramid Winery is also know for its Sparkling wines. Summerhill is committed to producing 100% organic wine. Their Kelowna vineyard is now in the process of applying for our Demeter Biodynamic certification. 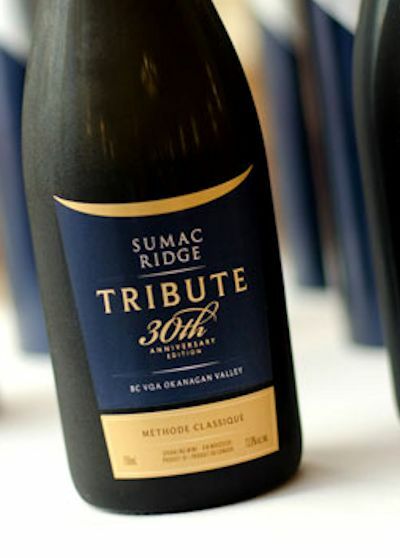 Sumac Ridge began a sparkling wine research program in 1985 and released its first commercial sparkling wine in 1989. The research program tested a wide range of grape varieties and yeasts to determine the most suitable. The goal was to create an ultra-premium sparkling wine that was fermented and aged in the bottle in the traditional method of France. The final wine was developed using a blend of Chardonnay, Pinot Noir and Pinot Blanc and was named Steller's Jay after British Columbia's official bird. 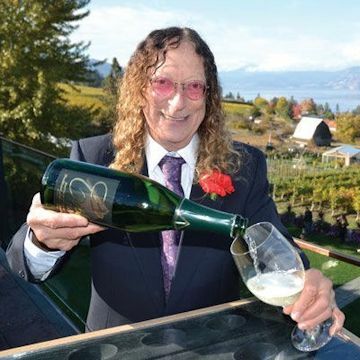 The wine was released in 1989 and has become the largest selling premium sparkling wine made in Canada. The sparkling wine program requires intensive care and maintenance. The bottles are hand riddled regularly to move the yeast cells to the neck of the bottle. The onerous process is supervised by long-time Sumac Ridge employee Wayne Cousins. The sparkling wine cellar, affectionately known as "Wayne's World", houses over 250,000 bottles of aging wine at any given time. This 100% chardonnay was aged for three years, building subtle almond complexity into the dried apple, lemon and shortbread aromas. 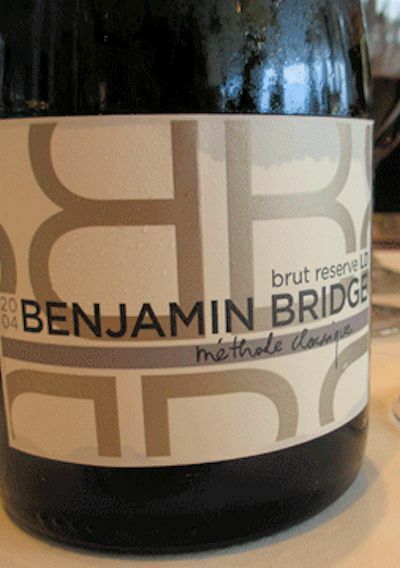 It is light-bodied, lively, gentle, delicate and a touch sweet, yet built on a beam of mineral acidity. There's excellent length on the finish. 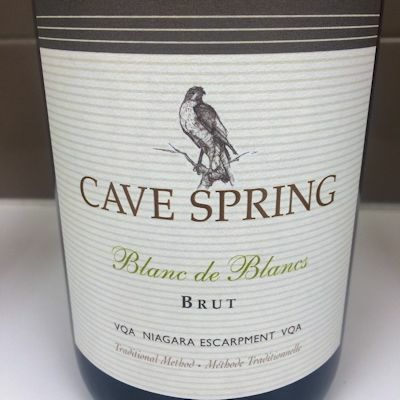 This wine recently received the coveted Lieutenant Governor's Award for Excellence in Ontario Wine in the sparkling wine category . The award was presented in July by the Honourable David C. Onley at Queen's Park in Toronto. Festive pink hue with fragrant frui notes and touch of sweetness on the finish. * By mutual agreement only wines produced in Champagne France may be called Champagne. In June, 2003, Canada and the European Union announced that they had entered into an agreement that will commit the parties into protecting each others’ geographical indications for wines and spirits. The agreement has yet to be ratified by the European Council and the Canadian Parliament, and it is not known when ratification will occur. However, the main effect of the agreement appears to be to phase out the generic use in Canada of a number of European geographical indications for wines. While the terms of the agreement and how they will dovetail with Canada’s existing laws regarding the protection of geographical indications, which are incorporated into the Canadian Trademarks Act, remains unclear, the intent appears to be that Canadian wine makers will cease use of certain French geographical indications in three stages. In the first stage, the use by Canadians of Bordeaux, Chianti, Claret, Madeira, Malaga, Marsala, Medoc, and Mosel will cease as soon as the agreement comes into force. Since these indications are not presently used by Canadian wine makers, this particular provision is of no more than academic interest. The use of Bourgogne/Burgundy, Rhin/Rhine and Sauterne/Sauternes will cease by December 31, 2008. Since the use of these geographical indications by Canadians is today virtually unknown, this provision is also of no great significance. Finally, the use of Chablis, Champagne, Port/Porto and Sherry will cease after December 31, 2013. These geographical indications are currently in widespread use by Canadians as part of generic wine terms like “Canadian Chablis” and “Canadian Champagne”. This therefore appears to be the principal real effect of the agreement. One of the least familiar types of sparkling wine produced in Germany and Austria is called Sekt . Sekt is made with Riesling, Pinot Blanc, and Pinot Gris grapes in Germany and Welschriesling and Gruner Vetliner grapes in Austria. The Hungarian equivalent for sparkling wine is ' pezsgo '.